Featuring the revolutionary FreeFall trigger, the 13 Fishing Special Edition Black Betty FreeFall Inline Ice Reel gives anglers the freedom to hit specific depths and get instant hookups by releasing the trigger in the target zone. 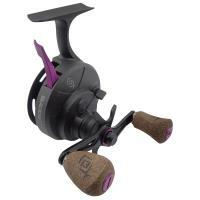 Dominate on the ice this winter with the 13 Fishing Special Edition Black Betty FreeFall Inline Ice Reel! 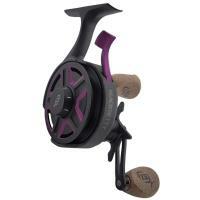 Featuring the revolutionary FreeFall trigger, the 13 Fishing Special Edition Black Betty FreeFall Inline Ice Reel gives anglers the freedom to hit specific depths and get instant hookups by releasing the trigger in the target zone. This system will instantly re-engage to maximize your strike-to-hookup ratio. 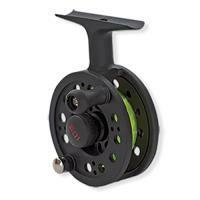 Perfect for shallow to mid-depth ice fishing, this reel can be easily operated one-handed. The Black Betty Ice Reel utilizes an airfoil carbon inline frame design with a carbon drag system for a lightweight yet sturdy reel that can handle the harsh winter weather. 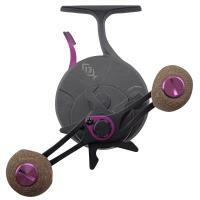 Dominate on the ice this winter with the 13 Fishing Special Edition Black Betty FreeFall Inline Ice Reel! Is this actually anodized purple, or is it the lime green, and just a purple looking photo? 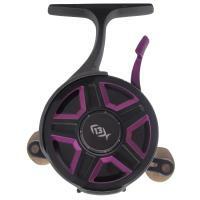 These reels are black and purple, just like the photo. They are just like the photo with the purple anodize. Is this available in right retrieve? Or was it ever available in right? Yes these reels will work for either right or left. This clearly states left retrievial, I own a few others. It’s not interchangeable. Is it available in right hand? 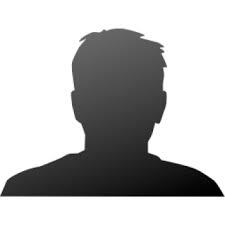 This is not available in right hand at this time. What is the difference between the Black Betty FreeFall and Special Edition Black Betty FreeFall other than appearance? The color is the only difference.